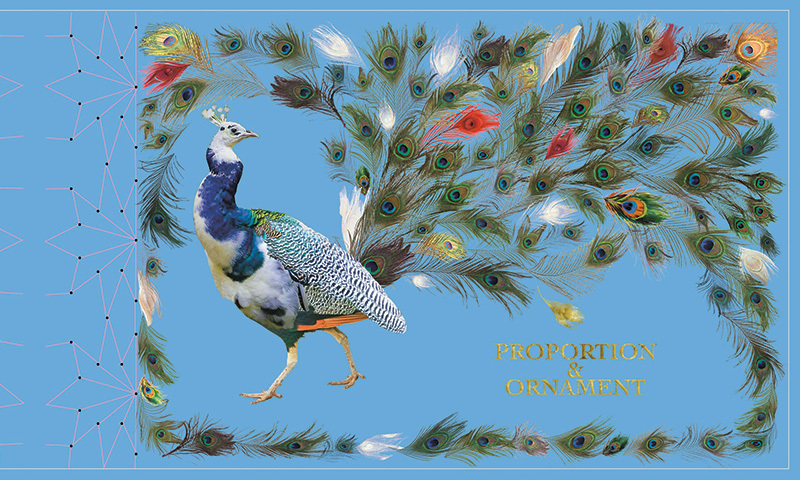 Proportion & Ornament boasts elaborately tied string binding with waxed Irish linen, no less, and a peacock-clad cover dripping in decadent arrangement of greens, golds, reds and blues. One suspects from the onset that Proportion and Ornament is to be understood in terms of its aesthetic value and experience. If the cover and binding present an artistic wonder, the innards are no less surprising. Swenson and Li have deconstructed and arranged Jane Austen’s Pride and Prejudice into non-linear, narrative-defying lexicon poems. Though some poems seem to have a certain sense about them, on the whole, it is unclear what exactly the poems seem to be getting at—one may come to the conclusion that due to the lack of punctuation and the seeming randomization of arrangement, that a type of Joycean modernism is at work here. Accompanying selected poems are Yellow Submarine–reminiscent illustrations (see “Eleanor Rigby” sequence), layered with 1800s gilded stylings that ultimately create a feeling of pomp and circumstance. Yet, one must ask if the illustrations are attempting to fill in the (lack of) story or are there to merely provide atmosphere. I won’t call it satisfaction, or dissatisfaction. I’ll let a beautiful thing be just that.